This video has some useful tips, tricks, and ideas to get children started keyboarding who may not be ready to touch type. I’m a great believer in ensuring that children know their way around a keyboard very early on: from 7 years old ideally; though it’s generally believed that they may not have the motor coordination or finger span to truly touch type until about seven or 8 years of age. However, children of any age can begin exploring keyboards, letters, and screens. It is an essential 21st century skill that people don’t learn automatically: they need instruction and practice. Learning to type saves enormous amounts of time and enables us to communicate more proficiently and effectively; cognitive automaticity. With typing we are freed from the slowness of handwriting, allowing us to get our ideas down at the speed of thought. I haven’t written by hand for years, except for my signature and the odd shopping list. Ultimately, typing for authentic reasons is the aim but children benefit from a touch typing course (we use BBC Dance Mat as it’s free) where they learn to type without having to compose at the same time. It is said that 8 year olds can write between 14 – 17 words per minute; with regular practice a child that age could be able to type about 30 words per minute. Devoting 10 minutes once or twice a day is the most efficient method; and it can help children focus in the morning or after lunch or at home. That tiny amount of time can have great payoff by the end of the year. Along with learning the keystrokes it’s important to emphasize good posture, choosing the right height of chair, taking breaks every 5 minutes, moving and looking away from the screen, etc. We also need to make time to teach all children (as we tend to do with learners with dyslexia already) the skills of planning and organising a dictated composition. Typing may well be regarded as outdated as handwriting in a few years time when voice recognition software is ubiquitous. For many of course, much writing is performed on hand held devices with thumbs alone. I suspect, though, that individuals will choose what style of ‘writing’ suits them best as long as they have the knowledge and understanding of the benefits of all methods of different forms of communication and access to all available tools – and the flexibility to explore new ones that we haven’t even thought of yet. Thanks to the innovative educator blog for the stimulus. In this online public lecture, Professor Ian Smythe talks about technologies available for free to support learners with dyslexia. In this webinar, Professor Ian Smythe will present a number of free resources that can be used to assist learners with dyslexia to access materials on and through their computer. In a social model of dyslexia support, appropriate assistive technology would be supplied free to everybody, irrespective of the extent of their disabilities and the paperwork to support it. However, current policies provide money to the lucky few with little analysis of impact, productivity and value for money. Professor Ian Smythe shows that there is plenty of free software available, and often it is as good as the commercial versions. A dedicated web page with resources will be available after the talk. This webinar is aimed at teachers, school administrators, parents and learners themselves. Here is an incredibly useful site that highlights lots of free resources with inclusion in mind. There are many links to some really interesting resources which could be hugely stimulating and valuable to all learners but especially those who learn in non-traditional ways. a set of principles for curriculum development that give all individuals equal opportunities to learn. My passion is to remove the obstacles to learning for all students and these free tools offer opportunities for struggling learners that promote academic success. When material is digital or electronic, it is flexible and accessible. It is our responsibility as educators to provide materials that promote success. 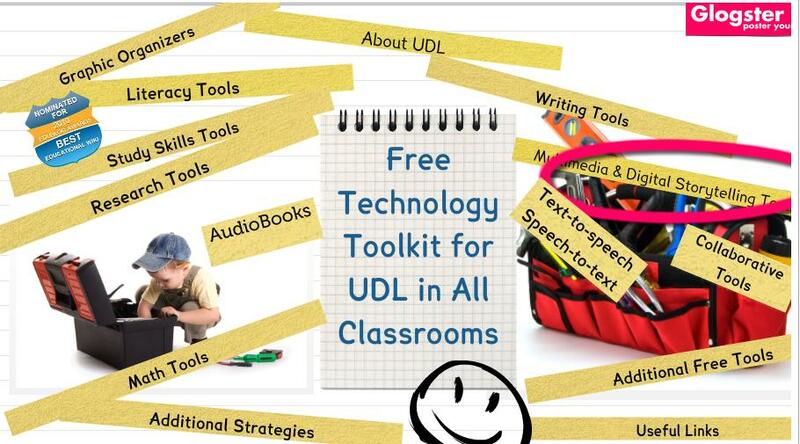 Please encourage all educators to consider using these free tools. Just discovering Glogster (Where have you been all my life?) is worth the visit! … was how I began my presentation at BETT last week. I had been invited by the British Dyslexia Association and iansyst.com to talk about dyslexia friendly schools and the use of digital technologies. But I started with a story just to set the mood (of which more later). Nobody fell asleep even though it was after lunch and Olympia is a crazy and tiring place to be at conference time. I then talked a little about the process some schools in East Lothian have embarked upon whereby the whole staff commits to working towards pledging to be a Dyslexia Friendly School. We audit practice, identify areas for development and evaluate progress. Difficulties are almost entirely created by the context and conditions in which learning takes place. Digital technologies can minimise or even remove literacy difficulties altogether. ICT not only assists access to the curriculum but enables learners with dyslexia to personalise their own learning. The central component of my presentation was about what we mean by the term ‘literacy’ as our interpretation has implications for the fundamental beliefs and practice we have taken for granted for a long time, and has profound implications for learners with dyslexia. The ‘Big Debate’, in simple terms, is that between the purists who say that literacy is about the written or the printed word and the techno-zealots who claim that print is dead. I proposed that neither is accurate, and that literacy is a constantly evolving process; one which must encompass new technologies and approaches to accessing ideas, experiences, opinions and information. My story was about 2 youngsters; Matilda, a fluent and enthusiastic reader and writer but one with a relatively fixed mindset, and Leo whose formal literacy skills were undeveloped but who took risks with his learning – mainly out of school using multi-modal platforms and media. I claimed that it was a youngster like Leo who is more likely to be a successful learner in the long term as he is a critical and creative thinker whose skills will be highly prized in the Information Age – just as long as he manages to survive school with his sense of self worth intact. I described how Leo constructs his own meanings and performs understanding using the tools with which he is familiar, and with real audiences in mind. These of course cross arbitrary divisions between age + stage and subject boundaries that he finds so irksome in school. Comprehension was something that happened when the work with words was done. It’s a club from which learners with dyslexia have been excluded for too long. If we base teaching on a conceptualization of reading as a single line of development from simple to more complex tasks, it will perpetuate the myth that reading is over and done with by age 7 or 8; unless you’re stupid. I posited that we were all emergent readers when we encounter new texts and media that push the boundaries of genre, form, format, and mode: on and offline? My experience with Inanimate Alice is an illustration. ‘Confusion is an enlightened reaction. If anyone is not confused then s/he is missing some of the details’. I’ve been planning my seminar, ‘The Dyslexia Friendly School: best practice with multimodal texts’, for BETT11. I can’t recall why I gave such a pompous title way back in the summer when I was asked to present a seminar but never mind. I have only been to BETT once before, although I attend SLF (SETT as was) every September and find it the highlight of my CPD calendar. I am really looking forward to it despite the fact that I shall still be jet lagged from my holiday in Argentina (only 6 more sleeps!). As the world’s largest technology in education show, 2011 is BETT’s 27th year and provides a platform for showcasing the very best technology in education solutions. Not just that, but the event also provides visitors with an opportunity to source advice on managing the change that has resulted from the coalition Government. New feature areas, zones, exhibitors and seminars now mean that for 2011, BETT is bigger and better than ever before. Anyone interested in attending my seminar can now register for a place online at http://www.bettshow.com/bett11/website/SeminarDetail.aspx?semid=Reg70. More information can also be found about the show at www.bettshow.com. I shall make sure some of my handouts appear here in due course. A recent article in the New York Times describes how a severely physically disabled boy reads a book for the first time independently with an iPad. Owen, 7, does not have the strength to manoeuvre a computer mouse. with the tiniest of movements, and thanks to the sensitivity of the iPad’s touch screen, Owen began to turn the pages of the book. He’s a normal child trapped in a not normal body,” said his father, Hamilton Cain, 45, a book editor. Since he received the iPad, Owen has been trying to read books, and playing around with apps like Air Guitar. And, one day, he typed out on the keypad, “I want to be Han Solo for Hallowe’en”. Thanks to Shirley Lawson for the link on the Support for All blog. The Scottish education intranet system, now being copied across the world, is allowing teaching staff and pupils to get some work done between the sledging and snowball fights. The Glow programme, which was the world’s first national intranet for education when it was launched in 2007, has been rolled out to all of Scotland’s 32 local authorities. It is designed to link the country’s schools and provide a forum for pupils, teaching staff and parents in which to share lessons and resources. In areas where snow has forced schools to close, Glow has proved its value, say teaching officials. Teachers can set work for pupils and engage with them, even though the school itself is shut. Officials say there has been international interest in the system since it was set up in 2007 at a cost of £37m. Run by the curriculum body Learning and Teaching Scotland, Glow can be accessed by 850,000 pupils, teachers and parents. In 2008, the Star Wars director and education advocate George Lucas, told the US House of Representatives that America should follow Scotland’s lead and set up a similar platform for online learning. I have to admit that after my initial enthusiasm (I did make some small contribution to the original tendering process all those years ago when Glow – or Spark then SSDN as it was then – was a mere twinkle in the eye) I let my own Glow Group fall into abeyance and only logged on infrequently. And let’s just say that my role as a Glow mentor never really took off. However, this inclement weather and exponential leaps forward in take up and content mean that I am more inclined to speak about Glow’s benefits to all and sundry. Let’s hope others do the same. Here’s a post from Anna Rossvoll, Creative Learning whatever the weather, wherein she describes using Glow this week.